Rover P5 (3 Litre) and P5B (3.5 Litre) Development Story. In the aftermath of the Second World War, Rover were riding-high on the success of the P4 and Land Rover (below), under the leadership of Spencer Wilks, with technical matters under the management of his brother, Maurice Wilks. 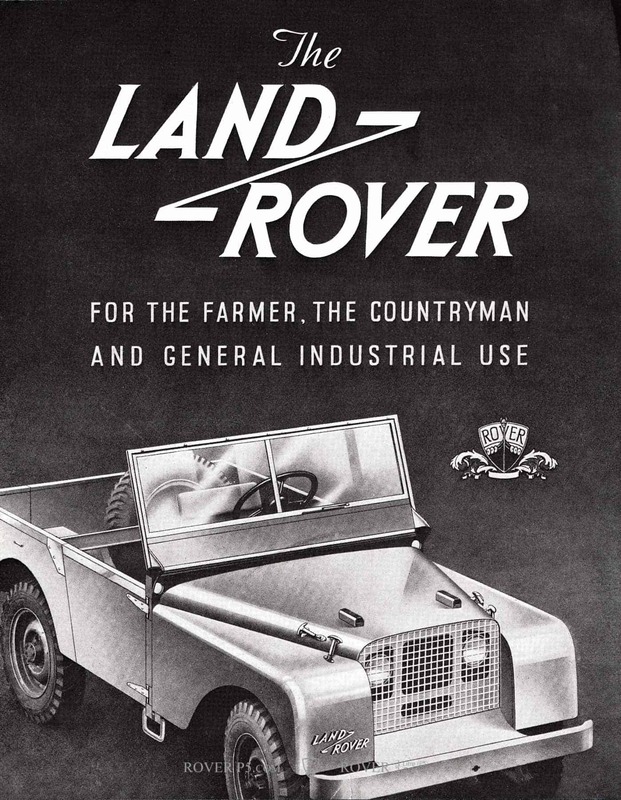 Sales of the Land Rover in particular had far exceeded Rover’s expectations, providing the company with the funds to spend on expansion and development of advanced new cars. So, in the early 1950’s, Rover started to plan for the replacement of the P4 with the P5, which was specified to be lighter and cheaper to produce, and would be the first Rover with monocoque construction. It was hoped that the new car would sell for around £650. The design progressed with distinctly trans-atlantic influences, including an integral sun-shield over the windscreen, and a distinct kick above the front of the rear arches that echoed the P4. The monocoque design, with unstressed outer panels that bolted on, allowed a much lower floor which in turn allowed a more streamlined overall design. The front suspension was to be torsion-bar and double wishbone, and the rear suspension was to be independent, with 4-wheel disc brakes – unheard of in the early 1950’s. Rover was also designing a V6 engine for the car, but development problems meant this engine was ultimately abandoned. As can be seen in the image below from 1954, the new car was to be quite a dramatic change from the upright and sober P4, reflecting Rovers growing confidence. By 1955, Rover was facing serious issues caused by limited space at the Solihull factory due to the success of the Land Rover. 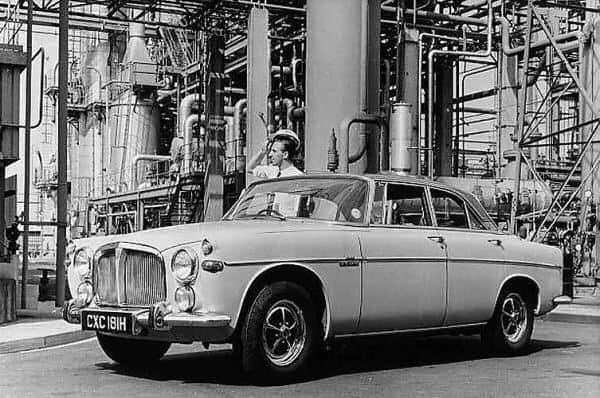 The company had failed to secure planning permission to expand the factory, and wisely Rover didn’t try to build a new factory in some far-flung location (something that Rootes, BMC and others did, with the help of Government grants for areas of high unemployment – the results were short lived and helped destroy the British car industry, but that’s for another time), and it was clear that a new high-volume car would exacerbate the space problem and cause severe production difficulties. Instead, Rover decided to develop a larger, lower volume but higher margin car instead. This was the genesis of what we know as the P5. The new car was made larger, and the engineering simplified (out went the independent rear suspension and 4 wheel disc brakes). 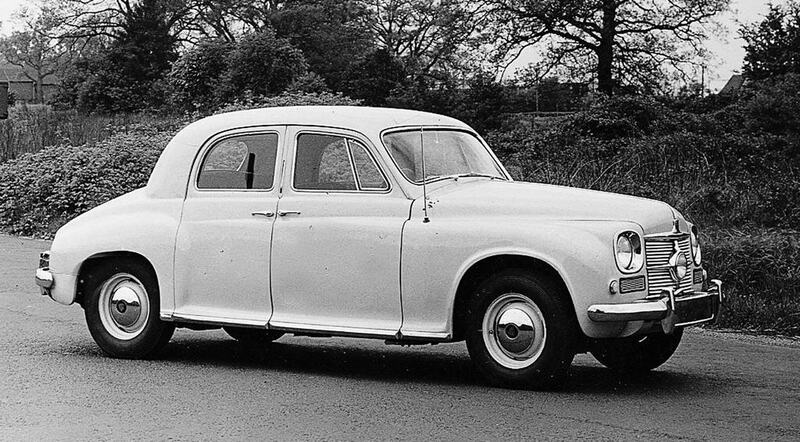 Stylist David Bache had joined Rover in 1953, and this new car was to be his first complete design. Initially he designed a low-slung saloon, but this was thought to be too much of a change for the typical Rover buyer, so the design was changed to be more upright and imposing, but still retaining elements of his first design. Out went the kick in the side line, to be replaced by a graceful uninterrupted line from front sidelights to rear lights. The waistline was relatively high with shallow glass, and the driving position commanding, with the tall Rover grille integrated neatly at the front. This article is copyright Richard Lamsdale (www.roverp5.com). By September 1955 the design was further refined. The windscreen sun-shield was further reduced in size, the front indicator design was still changing, the door frames weren’t yet finalised, and the dog-leg front edge of the front doors wasn’t as pronounced (this effectively moves the front door front edge forwards, allowing the wrap-around screen whilst providing easier access for the drivers legs) but generally the shape was now very close to the final production version. Styling was then refined as the engineering package was completed – as you can see below, only details changed over the 18 months from September 1955 to April 1957, with the sun-vizor disappearing completely and the door frames resolved. 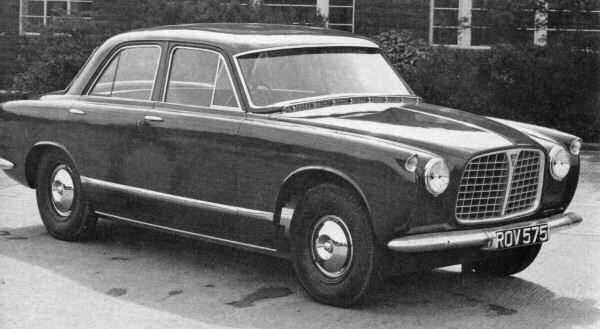 David Bache also styled a 4-door Coupe (‘coupe’ meaning ‘cut’ in French) version of the car. It was initially proposed to use frameless doors and no central B-pillar, but sealing problems meant that the final version had slim stainless steel window frames and kept the B-pillar. The roof was 2 ½ inches lower, but otherwise the car was unchanged from the Saloon, although it was sufficiently different looking and attractive to get the go-ahead for production. Engine-wise, after the demise of the V6 project it was decided to use the P4’s 2.6 litre in-line six, but enlarge it to 3 litres. This necessitated moving the bore centres, and adopting a seven-bearing crankshaft. The manual gearbox was basically carried-over fro the P4 with a Borg-Warner BW35 3-speed automatic as an option, and all-round 11 inch (280 m.m.) Girling drum brakes also featured, although they didn’t last long after launch. David Bache also created what is widely considered to be one of the best car interiors of any car. He designed a full-width shelf at knee-height, with all instruments and most switchgear in a pod mounted above the steering column. In fact, this basic design can be seen in subsequent Rovers, through the SD1 in 1976 and even in the Austin miniMetro of 1980. There was plenty of leather used for the seats and other trim, and wooden cappings on the doors and across the dashboard. It was a simple yet elegant design that lasted right through the cars life with only subtle updates. There was a concerted effort to get everything ready for launch, but it became clear the Coupe would not be ready in time, so it’s launch was delayed until after the saloon was launched. In fact, even getting the saloon ready was a major challenge, but the new car was finally launched at the Earls Court Motor Show in London in September 1958. 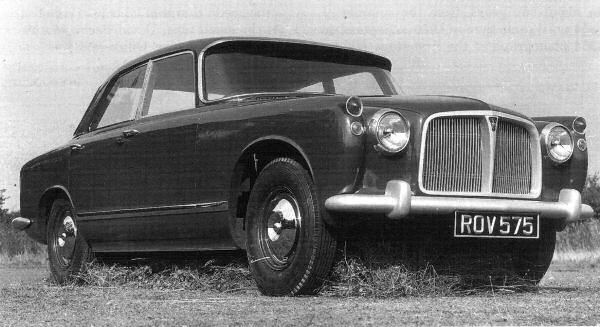 Finally, after a long and winding development, the Rover 3-Litre (P5) was ready for launch to the press and public. The car was launched at the Earls Court Motor Show in London in September 1958. There were no cars available at the launch for te press to drive as they weren’t quite ready to be exposed to close scrutiny, but this seemed to pass without comment at the time. When the press finally did get cars to test, the Rover 3-Litre was generally well received, and was seen as a significant advance over the P4, which was looking somewaht old-fashioned by the late 1950’s. The cars styling, ride and interior space were praised. The main criticism was of the engine, which whilst refined, would only achieve 96 m.p.h. and a 0-60 m.p.h. time of 16.2 seconds. A somewhat notchy gear change and and heavy steering were also mentioned at the time. Updates were swiftly made to the car in August 1959 to address the most urgent issues, with front disc brakes improving the stopping-power of the car, and a revised 3 litre engine allowing the car to finally break 100 m.p.h. An automatic version tested by The Motor magazine in 1960 recorded a top speed of 95.0 m.p.h. and could accelerate from 0–60 m.p.h. in 17.1 seconds. Fuel consumption of 20.5 miles per gallon was recorded. The test car cost £1864 including taxes. In October 1961 the Mk IA was introduced. This featured a great many detail improvements that were prompted by customer feedback and Rover’s own testing, some of which was completed with Pressed Steel who produced the bodyshell. Items such as bumper mountings, boot sealing, heater and wiring harness were revised and improved. Body-wise the main change was the addition of front quaterlight windows. Mechanically, Hydrosteer power steering was added as an option to overcome the heavy standard setup. October 1962 saw the Mk II being introduced, with slightly more power from a new induction arrangement and a new head design (the Weslake head, named after it’s designer Harry Weslake whom Rover had asked to help with the engine improvements). This gave a welcome 16% improvement in power. Mk II cars also featured slightly revised suspension – it was lowered by around 1 inch, damping was adjusted and Polyurethane discs were added between the rear spring leafs to reduce friction and improve the ride. The interior was also improved with a slightly redesigned dashboard. The Coupe was also finally launched alongside the MkII, with a 2 inch lower roofline and more raked rear screen, adding some glamour to the range for an extra £200. For that the buyer also got standard power steering and additional instruments in the form of a rev counter, with the other dials (Oil Pressure, Ammeter, Water Temperature and Fuel Gauge) being separated and relocated under the main binnacle in seperate pods. Although superficially similar, there are actually many detail differences between the Saloon and Coupe (door locks, door trims, rear seat) although these are only obvious in a side-by-side comparison. October 1965 and the Mk III was introduced at the British Motor Show, with more power (again), a new Borg Warner Type 35 automatic gearbox, a change to negative earth electrical system, new front seats, an improved front tool tray that doubled-up as a picnic table, rear cup holders (in 1965!) in the centre arm rest, and a rear heater with separate control for rear seat passengers. Externally there was a revised grille, and a slightly revised side-trim which went all the way forwards to the front indicator, rather than stopping above the front wheel. Finally, and most dramatically, the P5B was introduced at the British Motor Show in September 1967, featuring an all-new 3.5 litre V8 engine. The engine design had been purchased from Buick in the US, who were turning away from aluminium engine blocks back to steel, and had no need for the engine. Rover took the design and made many changes, and in the process created a classic engine that would go on to long-outlive the P5B. The new engine gave the P5B much improved performance, whilst also improving fuel consumption figures slightly. It gave Rover the opportunity to compete at a higher level, and gave a welcome bump to the P5’s decreasing sales. Aside from the new engine, there were other fairly significant changes: the front now sported two additional fog lamps below the headlamps, creating an even-more imposing front end, the car featured prominent ‘3.5 litre’ badging, and wheels were now chromed Rostyle, which many people thought were ‘a bit too much’ for a Rover, but for Rover were an inexpensive way to modernise the styling. Internally there was a large centre console housing additional switches for the fog lamps and heated rear window (when fitted) and a large ashtray. The Borg Warner BW35 automatic gearbox was standard. Both Saloon and Coupe were updated in the same way. There were a number of minor changes after this, but the P5B lived for 6 years largely unchanged. The shift pattern of the gearbox was changed slightly, the body was modified in 1970 to allow inertia reel seatbelts to be fitted, and that was about it. Production ended in June 1973. It wasn’t until the Rover SD1 arrived in 1976 that the P5B was replaced, but that wasn’t the original plan: the Rover P8 had been planned during the late 1960’s to replace the P5B in 1971, but that was cancelled by British Leyland just before the car was launched. 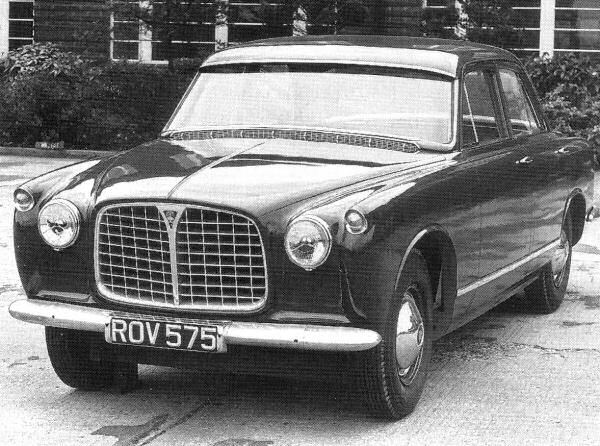 The Rover P8 Story will follow. The Rover P5 and P5B Development tracks Rover’s climb to the very top-level of car design and manufacture, both with the P5 and the P6, then the Range Rover. Leyland’s decision to cancel the P8 is believed to have been to prevent overlap in their range with Jaguar cars. Jaguar were well represented on Leyland’s board, and in hindsight it makes some sense in the context of the challenges Leyland were facing at the time. The tragedy is that constrained by the wider considerations of Leyland, Rover were unable to flourish into a standalone brand that would be able to compete with Mercedes Benz and BMW. It seems undeniable that Rover needed outside investment by 1967 if it was to prosper. Leyland made a lot of sense – they already owned Triumph who had flourished in the lower, middle and sportscar sectors of the market in the 1960’s. Rover, positioned in the upper and middle sector, together with Land Rover/Range Rover, would have provided full market coverage with little overlap. 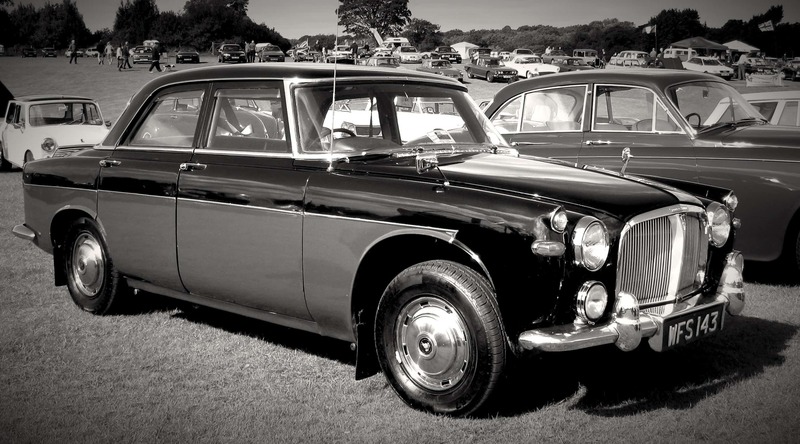 The Rover P9 sports car was being designed which would have covered the sports tourer market against Jaguar. The tragedy for Rover was Leyland’s decision, pushed by Government, to merge with BMC, the failing mass-market car producer who also owned Jaguar. This resulted in massive overlap in models and a huge drain on investment funding as Leyland fought to turn BMC around in the late 1960’s and early 1970’s, starving Rover of money and depriving them of a clear market segment to focus on. The SD1 was the last chance to rekindle the Rover name, but by then Rover was being run by ‘outsiders’ more used to manufacturing Allegro’s and Marina’s, with the result that the SD1, whilst being fantastically designed by David Bache, suffered terribly from build quality issues which destroyed it’s image. Rover Group managed to achieve a major turnaround by the early 1990’s in terms of engineering, build quality and image, mainly with the help of Honda and the Rover 200, 400 and 800, but again that was squandered by backwards-looking, poorly conceived products that failed to resonate with the market (new Rover 200, 400 and 75). The Rover name was also being put on increasingly inappropriate cars (Rover 100 (aka Metro), CityRover) in a desperate attempt to milk the last bits of advantage from the Rover name, but unsurprisingly that ended in depressing failure in 2005, when Rover finally went out of business. In many ways todays Range Rover is the true successor to the P5 and P5B. Large, imposing, upmarket, classy, and appealing to owners who put image and quality above dynamic capabilities and outright speed. For a more detailed account of the P5 and P5B development, I thoroughly recommend James Taylor’s excellent book ‘Rover P5 and P5B, The Complete Story’, available below.